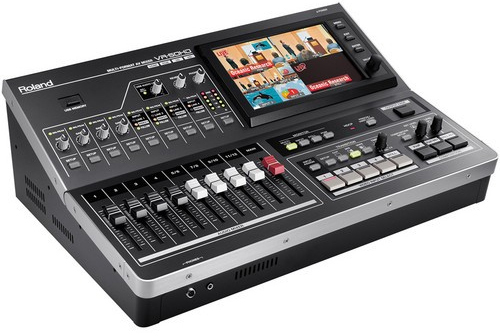 The Roland VR-50HD Multi-Format AV Mixer integrates an audio mixer, video switcher, multi-viewer touch screen and USB video/audio streaming into a stand-alone device. This portable live HD production solution combines the functions of a video switcher and an audio mixer, and it is ideal for use at live events, schools, churches, council meetings, and corporate events. The VR-50HD features four video input channels, which are fed by 12 inputs, and supports SD, HD, and computer-based signals. The mixer supports either NTSC or PAL standards, with selectable frame rates, and will scale input video to match the selected output resolution. The VR-50HD features four SDI inputs that support SD/HD/3G-SDI signals, two RGB/Component video inputs, two composite video and four HDMI inputs, as well as 12 analog audio input channels. Built into the front of the mixer is a 7" LCD touch-screen multi-view display that shows the four input sources as well as displays a red border on the active input source. You can set up and control the unit through the touch screen interface. The unit has a designated HDMI output that will send the multi-view display to an available HDMI monitor. The PGM output is available through SDI/HDMI/ and RGB/Component streams. It is also available via the USB output, which you can bring into an available computer or encoder to stream live. The VR-50 features two built-in full-resolution picture-in-picture channels, and you can layer the four inputs to make one composite in addition to the picture-in-picture channels. The V-40HD is equipped with four input systems (Inputs 1 - 4 ). Each of these systems has three types of input connectors --- HDMI, RGB/Component, and Composite --- allowing you to connect a total of twelve video devices. For output, the V-40HD provides three systems: Output 1 (HDMI/RGB/Component/Composite), Output 2 (HDMI/RGB/Component) , and Preview (HDMI). 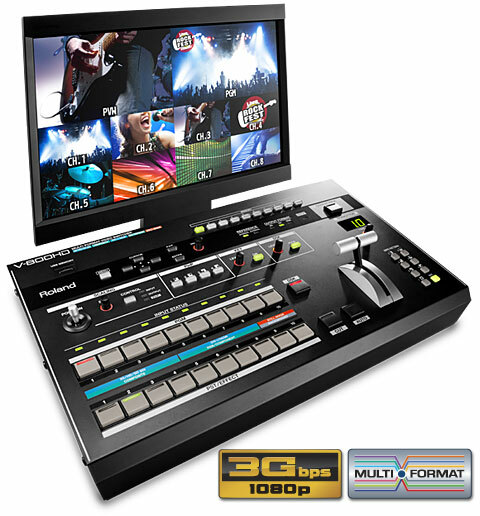 The Roland V-800HD Multi-Format Video Switcher is ideal for any live event or installation that requires the freedom to connect any type of source whether it be digital or analog, computer or video format. 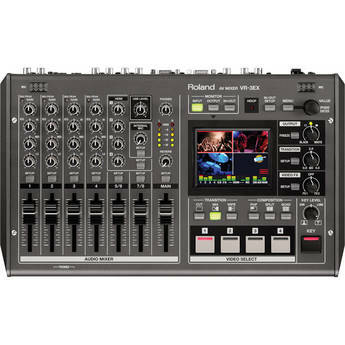 Just like the design of the popular Roland V-1600HD switcher the Roland V-800HD is a true multi-format video mixer meaning there is no need to match input sources to the output resolution. Every input has it’s own broadcast quality scaler that can individually scale, stretch, crop and zoom each source as required to fit any output resolution chosen. The V-800HD is HDCP compatible and also features a built-in multi-viewer output that provides a convenient monitoring solution when connected to an HDMI monitor. The eight mixing channels provide connectivity to 3G/HD/SD-SDI, DVI-A/DVI-D/HDMI, RGB, component, and composite formats – as well as an additional two channels for still images assignable via USB memory stick or frame grab. A newly developed key-compositing engine lets you adjust phase range, amount of chroma, and HSV color space parameters. Another key compositing feature includes an external keyer enabling CG titles and gradation clips, enabling impressive visual effects. 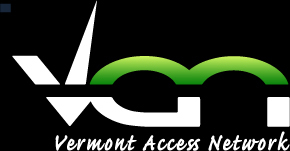 Assignable video cross-points allow reordering channel buttons which is especially useful when sudden changes in camera lines or differences in formats create blank spaces between select buttons on the bus. A dedicated composite output enables a down-converted SD signal that is always ready to use for archiving to a DVD recorder or to an encoder for streaming. The Multi-Zoom feature can be enabled when one video input is shared internally with up to three more inputs – essentially daisy-chaining it. The scaler for each input can zoom into any position in the video image giving the appearance that additional cameras are connected – creating a virtual multi-camera environment. Additional effects include a down stream keyer (DSK), a composite keyer, Picture-in-Picture and multiple transitions. The V-800HD supports an incredible variety of system design and creative production options for live or fixed installation applications. It is adept and handling LED wall sizing challenges and is ideal for any live event or installation demanding flexibility, stability, high quality, ease of use, and professional connectivity. With video output resolutions up to 1080/60p, 4:4:4/10-bit processing, and support for 3G SDI input resolutions; the highest quality video is achieved. The V-800HD Video Mixer strengthens Roland’s Multi-format video mixer line-up and is positioned to the pinnacle of quality video production for live event, broadcast, corporate, educational, and house of worship applications. Picture Quality at the Pinnacle of High Definition. Eight Multi-format Channels from Sixteen Inputs. 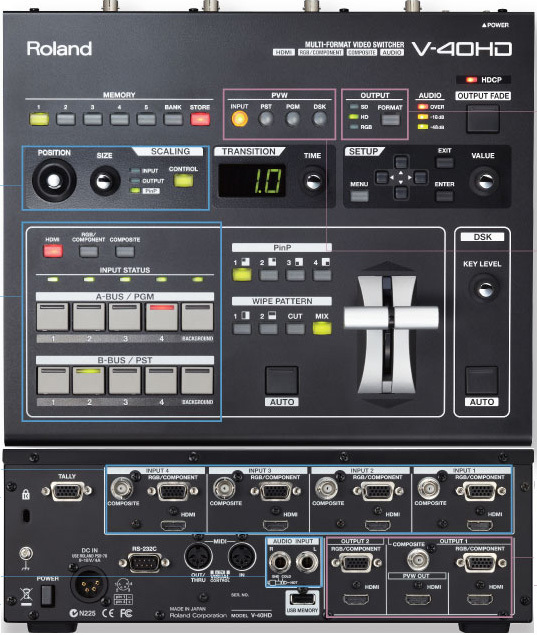 The Roland VR-3EX SD/HD A/V Mixer with USB Streaming is a live production switcher and web streaming device featuring 3 x SD HDMI/composite inputs, and an HD HDMI/component or SD composite input. The unit processes the video internally using progressive processing at SD resolution. This means the VR-3EX does not introduce interlace artifacts, which results in a cleaner output than with regular SD switchers. Four built-in frame synchronizers, one per input, allow you to support and cleanly switch input video from sources that are not gen-locked. Plus, the fourth input features a built-in scaler that allows you to work with HD resolution video. It features a scaler on the output, allowing you to upscale to HD if you require, and the built-in USB port allows you to simultaneously record your program to a Mac or PC or upload to various streaming services. This unit is well-suited for clubs, concerts, Houses of Worship, events, weddings, education, and sporting events. The VR-3EX features a built-in Keyer for luma, chroma, and PIP keying effects. It also includes 250 transition and 11 built-in effect types. The built-in 18-channel audio mixer accepts audio embedded in the HDMI stream, the 4 x balanced XLR inputs, unbalanced analog sources via the two RCA jacks, stereo mini jacks, and the built-in microphones. You can also delay the audio by up to 4 frames to adjust the "lip" of your video. The built-in multiview screen can show your four inputs on the screen at the same time and you can transition from one camera to the next by merely touching the camera view on the monitor screen.